The mission in the former Soviet republic was launched in 1997 by Pope John Paul II. It is entrusted to the order of the Missionaries of the Incarnate Word. To date, there are three parishes in the country, and about 20 priests, religious and young Tajik seminarians. The testimony of Fr. Carlos Avila superior general of the mission. 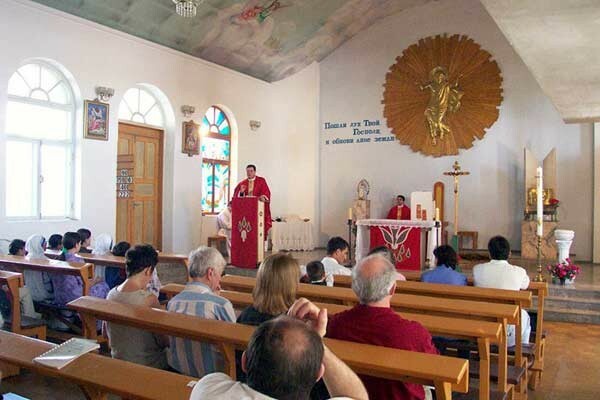 Dushanbe (AsiaNews) - The Church of Tajikistan is celebrating 15 years of Mission "Sui Iuris" which allowed the rebirth of Catholicism in the country after years of communism and the civil war of the early 1990s. For the occasion, Fr. Carlos Avila, a missionary of the Institute of the Incarnate Word, and superior general of the mission spoke to AsiaNews about the history of the small Catholic community in Tajikistan. It survived the horrors of war through the work of the priests and nuns of Mother Teresa, the only institution that has not left the country during the period of ethnic conflict erupted after the collapse of the Soviet Union. Below is the article by Fr. Carlos Avila. On 29 September 1997, His Holiness Pope John Paul II proclaims the mission "Sui Juris" in Tajikistan, to give greater attention to the Catholic faithful in the country. The mission is assigned to the Institute of the Incarnate Word. Today in Tajikistan there are three parishes dedicated to St. Joseph, St. Rocco and St. Theresa of the Child Jesus. Four IIV priests and three nuns of the Institute of the Lord and the Virgin of Matara and four sisters of Mother Teresa of Calcutta work in the territory. In these past 15 years, God has blessed us with some young Tajik vocations and there are currently three seminarians and three girls who have chosen religious life. The Catholic Church of Tajikistan has existed for about 40 years. The community began to develop from 1974 onwards and has a more solid structure with the construction of the first religious buildings in the capital Dushanbe and Kurgan Tubie in the south of the country. The first Christians are mostly of German origin from Russia, Ukraine and Lithuania deported to the country during the Soviet Union era. Because of the communist regime, for years the community of Tajikistan was isolated from the universal Church. They choose German as the official language of the liturgy, with locals taking the name of "German Church". Despite the isolation, the Catholics of Tajikistan grew and became one of the most important and numerous communities of the Soviet Union. With the tragic civil war of 1992-1993 most of the Catholics fled the country together with the citizens of other ethnic groups. For several years the churches were empty and without priests. The Catholic community was kept alive through the work of many of the faithful who chose not to flee. The sisters off the Congregation of Mother Teresa of Calcutta care for their spiritual and material wellbeing. They are doing everything to prevent the total disappearance of the community. In these years priests from Kazakhstan are sent for long periods to help the few Tajik Catholics. The presence of the priests allows them to emerge from the isolation of the past. The Catholic community is now no longer "the German Church", but is opening up to the world. Today the population identifies itself as the Roman Catholic Apostolic Church. "Sui Iuris" missions are mission territories which do not form part of any order, vicariate or apostolic prefecture. Such sites are governed by an ecclesiastical superior and depend on the parishes and religious personnel.